Following are the incidents where Durvasa has been involved with various people which resulted in curse. This is in continuation from this article. This was the turning point in the life of Sage Durvasa . Durvasa plucked a hair and directed to kill Ambarish. Lord Vishnu ‘ s came to help his devotee. 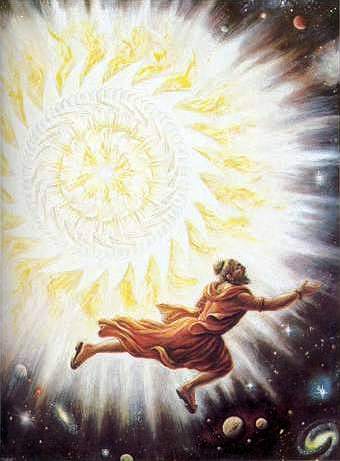 He used Sudarshana Chakra , which, after killing the demon , started to chase Durvasa . 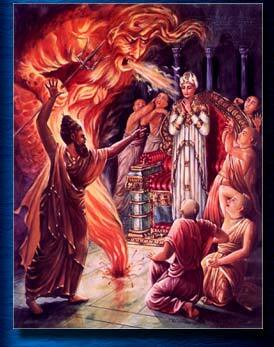 The sage sought protection from Brahma who expressed his helplessness . When approached , Shiva also cited helplessness and directed the sage to seek Vishnu for protection . However Vishnu said , ” let us all approach Ambarisha for relief ” . Seeing the dangerous state of the sage , Ambarisha said , ” Oh ! Sudarshana Chakra ! If I am righteous and if I am obedient to the pious people , may the sage Durvasa be saved ” . Then Sudarshana Chakra was pacified and it vanished . Tha anger and pride of Durvasa was humbled . The sage felt glad that he was cleansed of his evil trait . unbroken. Combined with this curse and Gandhari’s, as she had cursed Krishna to die an ordinary death. She thought that Krishna was the root cause of death of her sons.